One TV screen that does the lot. That's the plan for the new LG DM2350D Cinema 3D Monitor TV. For starters, it's a Full HD PC monitor. It's also a digital TV with an integrated DVB tuner and IR remote. But the LG DM2350D 's real party piece is that it throws stereoscopic 3D into the mix. Whether you want to watch Blu-ray movies or play the latest PC games, 3D support is promised. What's more, it all comes in a compact package that does a decent impression of a miniature high-end HD TV. If you're short on space but don't want to compromise on style, you could do an awful lot worse. Of course, all of this is theoretical. With so many features and different technologies on offer, there's an awful lot to get right and plenty to go wrong. Yup, LG has squeezed a digital TV tuner into the DM2350D's slim and slinky chassis. Factor in the IR remote control and the result is pretty much indistinguishable from a standard, small flatscreen TV. With one exception. Only standard-definition DVB-C and DVB-T broadcasts are supported. You can watch Freeview HD in its full 1080p glory, but only with an external box connected via HDMI. Consequently, digital TV viewing comes with standard definition TV's characteristic soft smeary image quality. It's fine for casual viewing, but HD TV addicts will not be satisfied. Of course, the HDMI ports mean it's easy enough to connect all manner of external boxes from Freeview HD, to Blu-ray players and games consoles. As a monitor for a desktop or portable PC, the LG DM2350D is pretty much par for the course. It's a 23-inch panel with a Full HD 1920 x 1080 pixel grid. At this price point – and bearing in mind the built-in tuner and 3D support - it's no surprise to find that the underlying technology is TN. It's the cheapest of the commonly used LCD panel technologies, and it typically translates into narrower viewing angles, reduced contrast and less accurate colours than more expensive alternatives such as IPS and VA panels. That said, TN technology is always improving, and LG's latest effort is one of the better TN screens we've seen. Part of the explanation is the use of an LED backlight. The result is richer, more saturated colours than you get with a TN panel powered by an old school CCFL lamp. Like most TN screens, pixel response is excellent, too, making this screen a great choice for keen gamers. Still, there's no escaping the LG DM2350D's fundamental TNness. If you want really broad viewing angles and accurate colours for video editing, you'd better look elsewhere. Overall brightness is another weak point. It's not actually an issue when viewing in conventional 3D mode. But it's a little disappointing in the context of LG's claims of increased brightness in 3D mode. The final PC-specific 2D image issue involves video inputs. For the most part, these are well catered for, with a pair of HDMI ports, VGA, SCART and component connections. However, for PCs, DVI and DisplayPort are preferable. It's quite common to suffer from scanning problems when controlling a monitor from a PC via HDMI. Our testing went smoothly, but in our experience, you're at the mercy of PC video card hardware and software vagaries if you roll with HDMI. 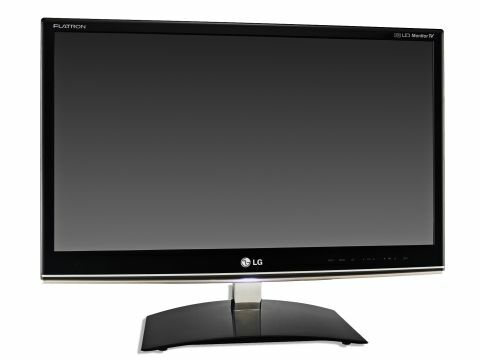 So, the LG DM2350D is a decent PC monitor and a tolerable TV so long as you factor in the Freeview HD issue. But what about its 3D performance? The screen's 3D technology is passive, polarised and orthogonal. That means polarised glasses (two pairs are provided - a pair of throwaway frames as per the cinema and some clip-ons for spec wearers), rather than active shutter glasses. The orthogonal bit matters because it makes this TV screen more sensitive to viewing angles. More on that in a sec. From there, things get a bit more complicated. In terms of 3D gaming, LG has gone with the TriDef platform. It's the solution chosen by AMD for its graphics cards, but it also works with Nvidia hardware. Game compatibility is pretty broad, and in our testing, we had no major issues with it. However, we did find it tricky to find the viewing sweet spot for the LG DM2350D, in terms of distance and elevation. Unless you get it just right, you'll experience variable degrees of double vision. The overall sense of depth and 3Dness isn't as dramatic as we've seen courtesy of the best active-shutter screens. Also, it's worth noting that both observed resolution and brightness take a hit in 3D mode. There's a price to be paid for flicking the 3D switch. Finally, it's worth noting that currently, the LG DM2350D doesn't support 3D Blu-ray via a PC. You need to hook up a 3D Blu-ray player to the TV for that. So, the support is there, it just makes life a little more complicated. You can't simply connect a Blu-ray-capable PC and have a single solution that does PC gaming, HD TV and 3D Blu-ray. You're going to need some extra boxes. As TN screens go, the LG DM2350D is decidedly decent. Thanks to an LED backlight you get rich colours. Black levels are above average for this panel type, too. The TriDef 3D tech also makes for good game support and relative ease of use - it just works, and the built-in TV tuner is a boon if space is tight. Stereoscopic 3D is an acquired taste at the best of times. With orthogonal polarised tech, getting comfortable and correctly positioned is a bit of a faff.Once you've done that, the image quality, brightness and sense of depth isn't exactly breathtaking. Lack of built-in HD TV support irritates, too. The LG DM2350D is a very strong all-round package for the price. Its lack of native Freeview HD is the only major issue.